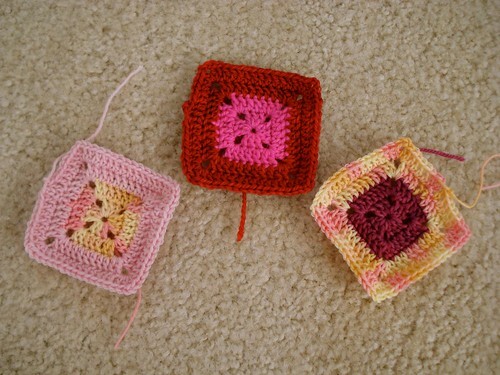 I've gotten a few more squares for The Babette worked up. I think at this point I have fewer than 20 of this size to go. I have a feeling I need more of the lighter colored squares, but I might sort through the pile (of this size) and see what I've got. I know I have plenty of middle range (colorwise) squares, and I have a lot of dark ones. I haven't really thought things through on the bigger squares, but I know I'll need this size and the smallest size to blend and connect the bigger squares, so I feel like I need a good mix of light, medium and dark.